Walk into the Culver Center of the Arts, and you’ll immediately find yourself immersed in the new, large-scale exhibition by Yunhee Min and Peter Tolkin. 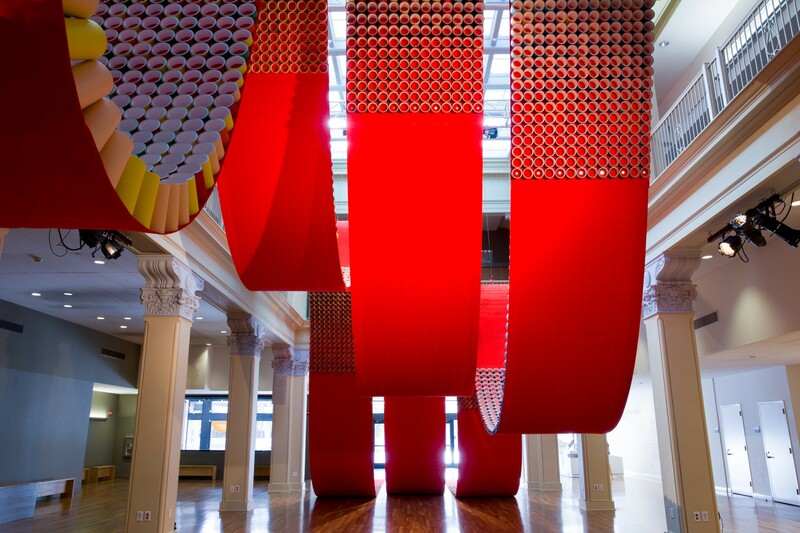 Three gigantic, undulating swathes of red fabric extend toward the entryway, inviting viewers to walk directly onto the massive artwork before arching sharply up toward the 40-foot ceiling of the Culver’s expansive atrium. 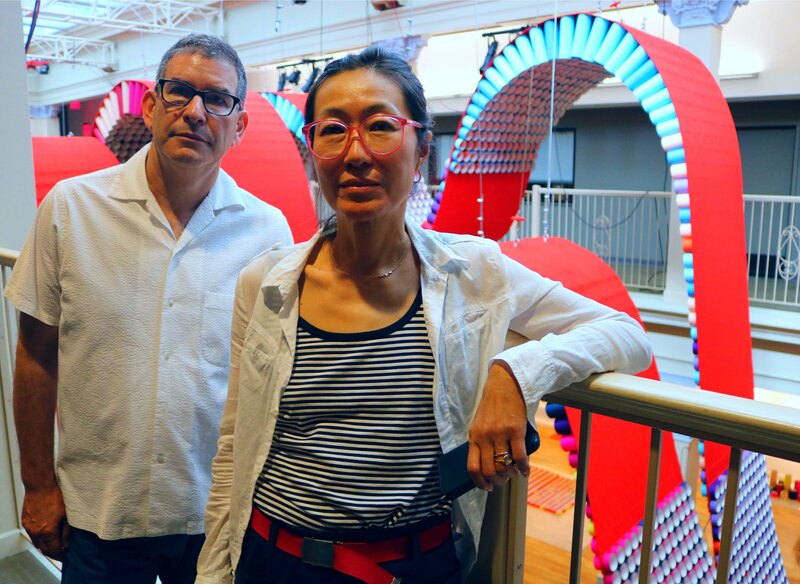 “Yunhee Min & Peter Tolkin: Red Carpet in C” intersects both art and architecture. The installation is constructed of 150-foot bands of canvas and over 15,000 multicolored cardboard tubes — its parabolic curvature and bright hues in sharp contrast to the muted neutrals and classical design of the atrium — and is meant to be experienced in relationship to the physical architecture of the Culver. The first fully realized artistic collaboration between Min and Tolkin, they drew inspiration for the artwork from a shared interest in music and its relationship to architecture. Min and Tolkin also cite interest in the graphic notational systems of experimental composers such as John Cage, Morton Feldman, and Iannis Xenakis as sources of inspiration. 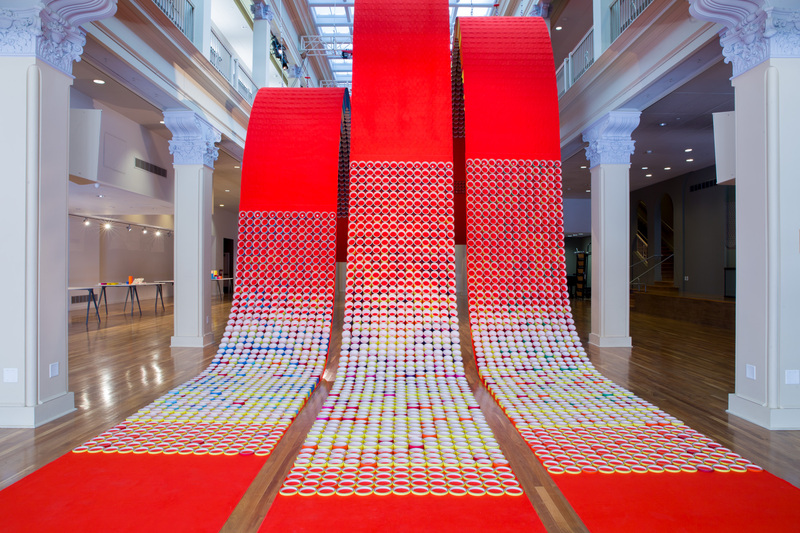 Although not intended to be viewed as a literal representation of music, “Red Carpet in C” uses color and form to engender a sense of movement and time. The title also plays off the seminal minimal work “In C” by Terry Riley, as well as the “C” in Culver. Like the “C” note in Riley’s “In C,” the color red stands as the dominant color, with the cardboard tubes creating myriad combinations of 13 colors and a sense of movement within the static object. Bold expressions of color are nothing new in Min’s practice as an artist. Primarily a painter exploring abstraction, she has also made site-specific projects approaching the scale of architecture, including the permanent installation “For Instance” at the Hammer Museum. Tolkin’s work as an architect has seen him collaborate with a number of artists, and he has produced several solo architectural installations including “Dunnage Ball.” When Min was approached by exhibition co-curator Tyler Stallings to spearhead an exhibition, it presented an opportunity for Min and Tolkin to collaborate and explore their common interests. First conceived nearly four years ago, “Red Carpet in C” is not only a massive installation but a feat of engineering. It took extensive modeling and testing with both complex mathematical algorithms and full-scale constructions in order to bring the artwork to fruition. The artists relied on physical and digital modeling to experiment with the forms, and the use of scripting software to develop and understand the curvatures of the piece in relation to the size and placement of the tubes. “This was quite an experiment because unlike structural materials with known physical characteristics, there is no pre-existing data for a structure made like this,” they said. As the concept continued to grow, so did the team responsible for making “Red Carpet in C” a reality. To help realize the construction, the artists brought on structural engineers to ensure the piece was sound and to develop the structural design using dynamic modeling tools. The eventual fabrication of the installation, a two-month process, evolved into a major collaborative effort with over 30 architecture students from Cal Poly Pomona led by Sarah Lorenzen, a professor at the university and partner at TOLO Architecture. The intricate installation process required the work of engineers, co-curator and UCR ARTS exhibition designer Zaid Yousef, and UCR ARTS staff. “Red Carpet in C” was also made possible with support from the National Endowment for the Arts and the University of California Institute for Research in the Arts. Suspended from the ceiling, visitors can experience the artwork from multiple perspectives: frontally from the entry, weaving internally beneath its curvatures from below, and by viewing the undulations of color from the second-story balconies that form the perimeter of the atrium. With “Red Carpet in C,” Min and Tolkin have produced a work that defies any singular reading of its relationship to the existing architecture of the Culver. “Red Carpet in C” is on view until Dec. 29. For more information, visit ucrarts.ucr.edu.